In this piece, Lawrence has painted Tawa, the sun, Hopi symbol for life. It is surrounded by red band, and then a night sky with stars. The sun-ray feathers are yellow with red accents. Tawa has five turquoise necklaces below the face. (Notice all of the colors in the face.) The other side of the pot features a starry night with Kokopelli, the “traveling salesman,” and trickster. 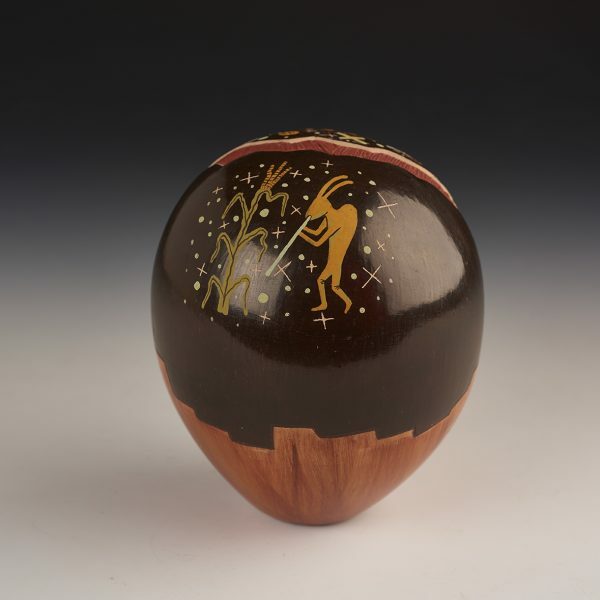 Kokopelli is playing to a corn plant, another Hopi symbol of life. 5 1/2″ high by 4 1/2″ diameter. Lawrence grew up in Walpi, the Hopi village on First Mesa. 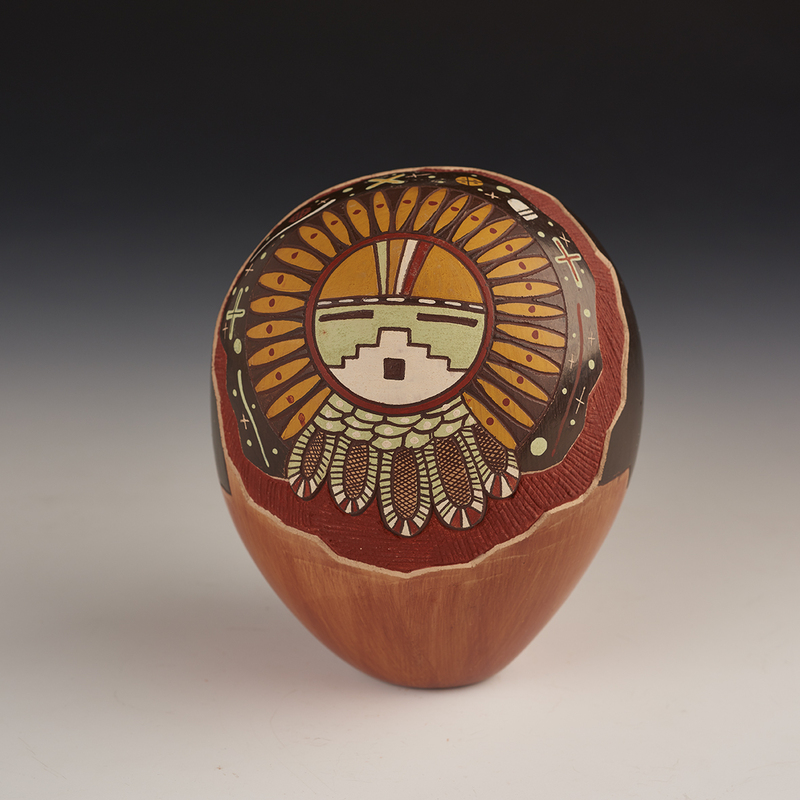 He began as a Kachina carver, and in 1985, began to make pottery, as well as Kachinas. Lawrence is an active member of his clan. 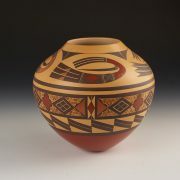 A unique potter, Lawrence specializes in colors other Hopi potters aren’t using. His vegetal and mineral paints are all derived from his experimenting with different herbs and minerals native to the Hopi Reservation. Reds are from iron oxide clays he finds near the Grand Canyon. Greenish-blue colors are made from clays containing copper minerals, Whites are from pumice he finds around the Flagstaff area. Yellows are from lamonite he finds near Mesa Verde. Browns are iron oxide mixed with green mustard plants. Blacks are mustard greens with a higher content of iron oxide. "I've spent years with various combinations” All of Lawrence's pottery are traditional hand coiled of local clays, and traditional fired outdoors. 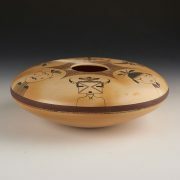 Lawrence has won many awards, and his work is in collections around the country.